I've just started getting a weekly update from my sister-in-law about her little family, and I thought it was a great idea! So I've decided to write down our life, one week at a time. I take a TON of pictures, but don't always remember some of the small details. I do try to write down the cute/funny things the kids say and do, but some of the seemingly insignificant details get lost, and those are the things that I'm sure we'll all like to remember in 20 years. So here goes my first weekly summary. We came home and had a “HULK SMASH” Family Home Evening lesson. We talked about how feeling angry is ok, it’s how we handle the anger that matters. We had a list of ways to respond to anger and the kids gave a thumbs up or thumbs down. Evan gave some great suggestions on what to do when you’re angry. My favorite was “just laugh!” He has been reminding Sophie all week when she screams “that’s a thumbs down for you!” I keep the Hulk picture up on the pantry door to remind them during the week what we talked about. I’m thinking of making a FHE board with a bulletin board for the weekly reminder. I’ll have to go sketch that project out. Speaking of projects, I painted that $15 Craigslist nightstand silver. I’m very pleasantly surprised with it! Spray painting hasn’t worked so well for me in the past. It was a win this time. I’ll share a picture when the new handle I ordered arrives. 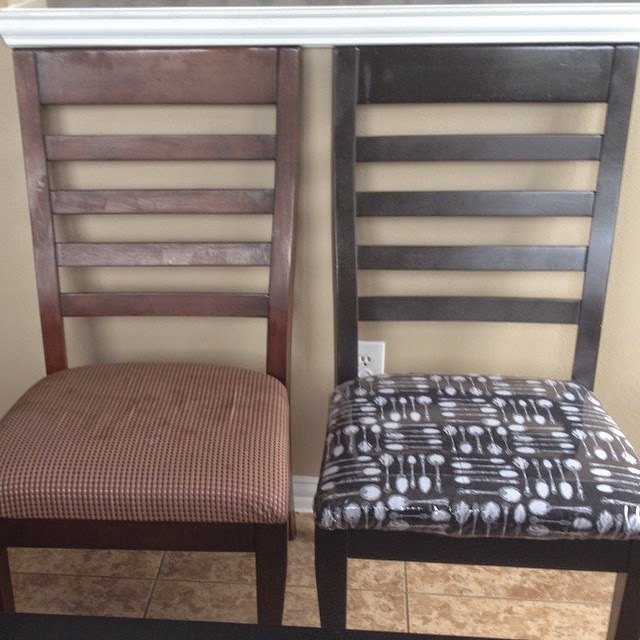 I also spray painted and recovered one of our dining chairs. I LOVE how it turned out! I’m hoping to finish the other 5 next week. I used the Rustoleum Metallic Spray Paint. It worked great for me! I’ve also been keeping busy teaching piano lessons, and we had our Halloween piano recital this Saturday night! It went really well! I’m proud of all my students for all their practice and their efforts in learning their pieces! Let me back up a little to actual Halloween though. The kids requested donuts for breakfast. Why not? It’s a holiday, and they’re going to be overloaded on sugar for the next few days anyway! Evan loves the chocolate covered kind with sprinkles. He chose a lemon filled one today… although it really doesn’t matter what’s inside since he just eats the top off of it. Sophie does the same thing. She always chooses the chocolate covered star shaped kind with sprinkles. I prefer the chocolate covered cream filled kind myself. (I believe they are called Bismarcks.) J While they bounced off the walls, I designed our annual Christmas card. I’ll have to do the annual letter next week. Anyway, I had taught our weekly music class on Wednesday (a group of us get together and take turns teaching a little class at the church. We sing a few songs and make a little craft, and once a month take a fun fieldtrip.) I had some foam pumpkin stickers and spider rings left over from that so the kids had fun with those. We had pizza and “frog eye salad” for dinner (thanks to my friend Nikki who I ran into at the grocery store who was planning the same thing). Evan was a little fascinated by the frog eyes, but kept saying “they’re not real Daddy.” Haha. After dinner Evan put on his Spiderman hoody and was ready to go! Sophie had been wearing her witch t-shirt and purple spiderweb tutu all day anyway, so we added her cute little fascinator. Easiest (laziest?) costumes ever. My same friend Nikki knocked on our door and so we all went trick-or-treating together! Evan had a blast getting candy, but he was even more excited to play with all the other kids who were out. Sophie got scared by a lady who opened the door and was dressed like a witch or the grim reaper or something. She’s not as big of a fan of Halloween as her brother is. 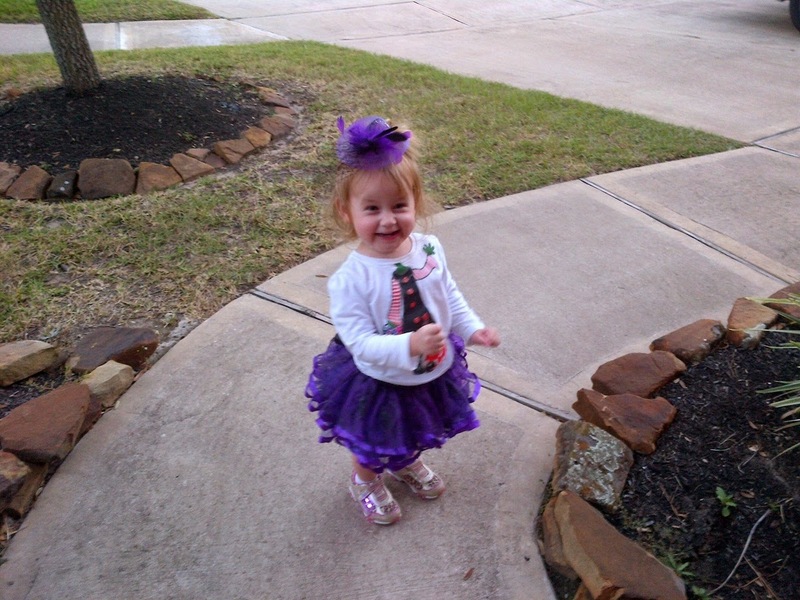 She did enjoy all the candy though! The next day we spent most of the morning waiting at Walgreens to do these biometric screenings to get a discount on insurance. It took kind-of a ridiculously long time, but it will save us $50 a month, so whatever. Finally, we were on our way to Dylan’s company picnic. We had lunch, cotton candy, and snow cones. There were funnel cakes, but the lines were always long. 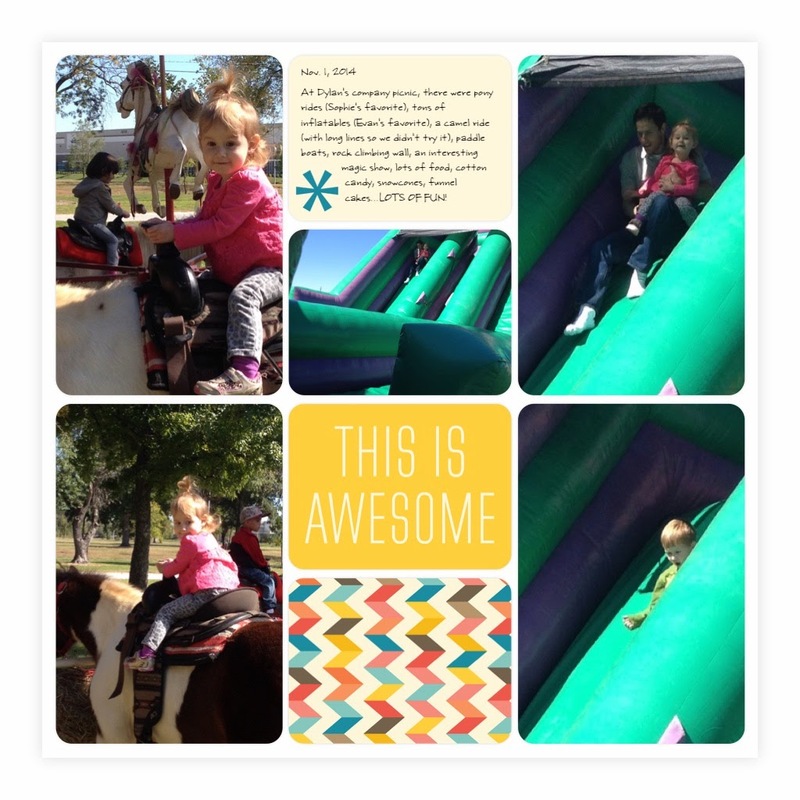 Evan loved the inflatable obstacle courses and slides, and Sophie LOVED the pony rides! There was also a camel, but again, the line was always long so we didn’t try it. (Same with the paddle boats, trampoline bungee jumping thing, and rock climbing wall.) Evan did get to see a “magic” show. The guy was honestly a little weird, and there wasn’t much magic, just some bad jokes, but Evan the entertainer enjoyed it. That’s all that matters. We came home and I had my recital (and of course forgot to take pictures!!!) while Evan took a bath…the entire time! (He was COVERED in sand from the picnic.) The kids did come out for rootbeer floats at the end though, and to play with all the other kids. I think it went pretty well!